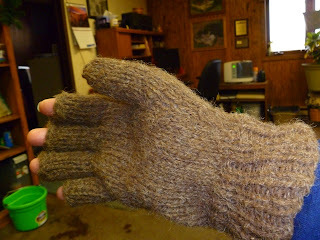 OK Acres Shetlands: When is a mitten, not a mitten? When is a mitten, not a mitten? I know what these poor things will be subjected to in terms of abuse, I had to keep that in mind when I decided if I wanted to use really fine fleece or something less fine that would be more durable. I opted for the less fine, more durable fiber, this yarn came from one of my coarser Shetland ewes that is no longer with us at OK Acres, my beloved first lamb, Abby. Abby was not as soft and silky as I'd like, but she sure made up for that lack of fineness in shear volume. 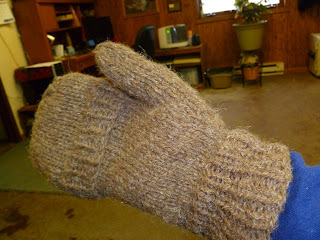 Although theses mittens are super silky, they are still soft and the rest of her fleece will make great chair pads and another pair of these gloves/mittens. She was musket in color, so that makes for a heathery look to the yarn. 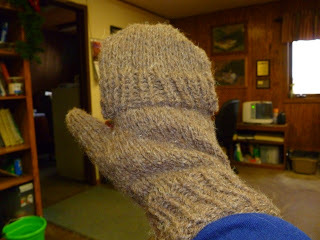 Just finished the pinkie finger on the second glove/mitten and only have to add the flap and I'm done. I'm smitten with your mitten!